Raymond Johnson Exhibit — Diné Studies Conference, Inc. 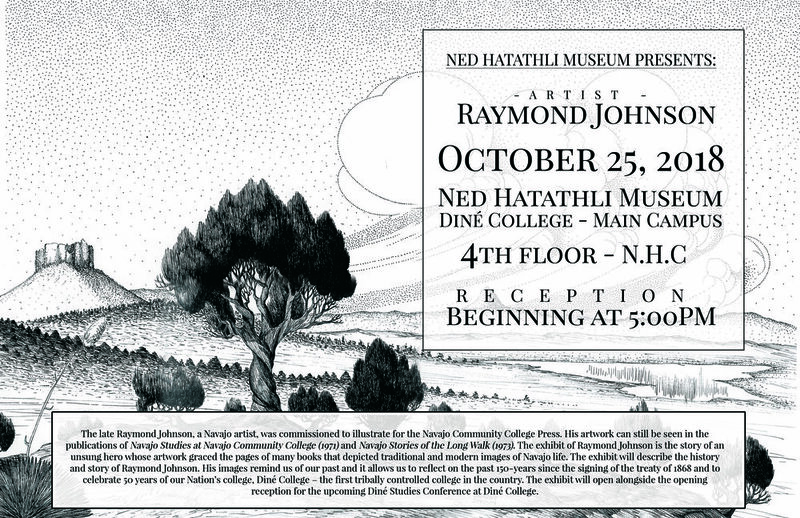 The late Raymond Johnson, a Navajo artist, was commissioned to draw the images for the Navajo Community College Press. His artwork can still be seen in the publications of Navajo Studies at Navajo Community College (1971) and Navajo Stories of the Long Walk (1973). The exhibit of Raymond Johnson is the story of an unsung hero whose artwork graced the pages of many books that depicted traditional and modern images of Navajo life. The exhibit will describe the history and story of Raymond Johnson. His images remind us of our past and it allows us to reflect on the past 150-years since the signing of the treaty of 1868 and to celebrate 50 years of our Nation’s college, Diné College – the first tribally controlled college in the country. The exhibit will open alongside the opening reception for the upcoming Diné Studies Conference at Diné College.